Hope my earlier posts on Ribbon elements helps you. 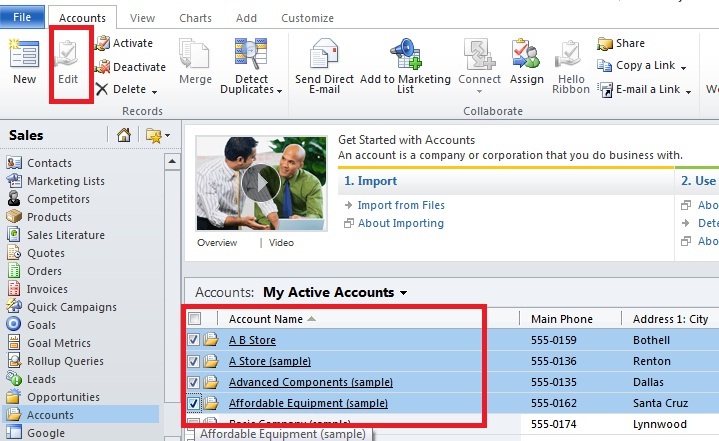 In this post we will see how to Enable/Disable Out of the Box ribbon elements in Dynamics CRM 2011. After going through the SDK, it seems there is no direct solution to override existing <CommandDefinition>. However, the documention says using <CustomAction> we can Add or Replace items in the ribbon. It gives me an idea to replace existing OOB(Out of the Box) ribbon item with Custom ribbon item and define our own <CommandDefinition> for that. At the same time we can also go with the OOB <CommandDefinition>. Lets see how we can do that stuff. Lets consider “Edit” ribbon item on the “Account” entity “HomePageGrid”. I want to disable this “Edit” button when user selects more than one record in the sub grid(i.e I don’t want “Bulk Edit” feature for Account records). The same can be achieved with security roles. However, for the sake of simplicity and to focus more on how we can override <EnableRules>, <DisplayRules> and <Actions> for an OOB item I have considered this scenario. Open “accounribbon.xml” file from the “sdksamplecodecsclientribbonexportribbonxmlexportedribbonxml” location in the CRM 2011 SDK. Below is the <CommandDefinition> for “Edit” button. Copy both of the definitions and we gonna use them in the next steps. Add “Account” entity to a solution. Export it. Open “Customizations.xml” file. Go to <EnableRules> section and add following <EnableRule> which will return “true” when only one item is selected in the sub grid. Add <EnableRule Id=”Sample.account.grid.OnSelection.EnableRule”/> to the <EnableRules> section. Here we need to carefully observe what we have done to replace existing “Edit” button with our own Custom Button. Here, I have given OOB “Edit” button “Id” as the “Id” for the new item. Do remember that, “Id” value in the <Button> should be same as “Id” value in the <CustomAction>. In other words the new Ribbon Item should have same “Id” as the OOB item. For the “Command” attribute I am planning to use OOB Command that has been defined for the “Edit” item. I am planning to use OOB features and in addition to that I am planning to have my own <EnableRules>, <DisplayRules> and <Actions> rules. Feel free to use your own Command if you require to. For remaining attributes also I wish to go with OOB except for the Images. Here I want to show images from my web resource. In this way we can override OOB behaviors and visualizations for OOB ribbon elements. If you want to have more complex queries for the <EnableRule> then we can use <CustomRule> to call a JScript function. 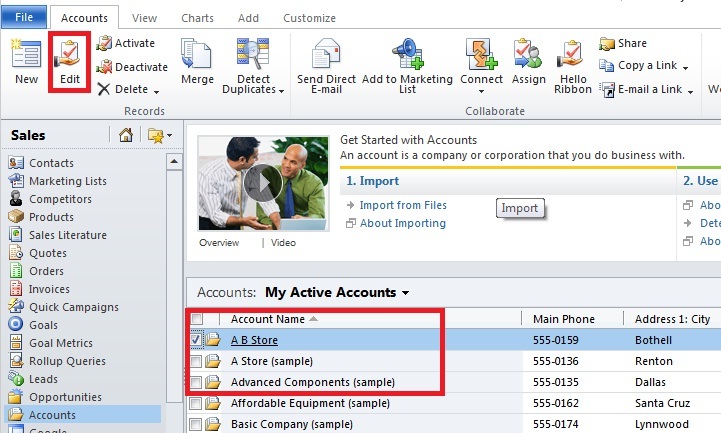 Please see my earlier post here: http://howto-mscrm.com/2011/04/how-to-series-6-how-to-use-customrule.html on how to use <CustomRule> with “HomePageGrid”.